High point award winner for 2008 is the mare OT Dytu RSI (Drkumo RSI x Dytatu RSI), who completed 30 American Endurance Ride Conference (AERC) rides for a total of 1535 miles. On two occasions, she completed five consecutive-day rides of 50-60 miles, including the Grand Canyon Pioneer in October 2008 at which she was first on three of the five days, second once, and third once. “Tu” also completed four 3-day rides and won one Best Condition. She was awarded the AERC “War Mare” for 2008. 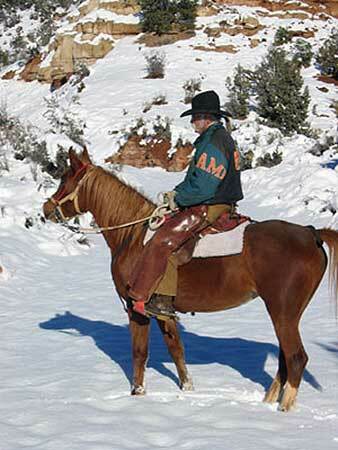 OT Dytu RSI was bred, trained, and ridden by Crockett Dumas, of Escalante, Utah, who competes in the heavyweight division. This is the first time an endurance horse has won the top Drinkers of the Wind award. She is also the only mare to make top 10 in 2008. The perpetual trophy awarded to the top horse comes from the estate of Walter Schimanski. Crockett will also receive a cash prize donated by Hansi Heck-Melnyk, long-time owner of Serenity Farms and a strong advocate for demonstrating the performance abilities of the Desert Arabian horse. Khehanad Adhem+/, 1999 stallion (Khe Adhm x Sahanade), who was top ten in 2007 during his first season of competition, showed at Training and First Level Dressage in Regions 11 and 14. He garnered Championships at both levels in both Regions. 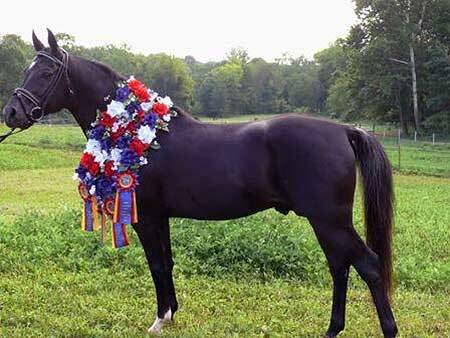 He was also Champion Stallion Sport Horse In-Hand and Reserve Champion Sport Horse Under Saddle in Region 14. He gained his Legion of Supreme Honor award from AHA during the year as well as multiple USDF awards. Khehanad Adhem+/ is owned and ridden by Lance Bowman, a student at the University of Kentucky. Shy Gayfeen++++// (Safeen x Gayleen RCA), 2007 winner of the Drinkers award, had another great season. The stallion was Reserve Champion in Hunter Pleasure (Region 17) and Hunter Pleasure and Hunter Pleasure AO (Region 6). He was Champion Arabian Stallion Breeding AT and Reserve Champion in Arabian Stallion Breeding (Region 6) and Champion Arabian Stallion Breeding (Region 17). Shy Gayfeen++++// was bred in Canada; he is owned and ridden by Cori Wilson. AAS Al Sakb+/ (1996 stallion, Desert Dhelall x AAS Fadh Alwalida+/) completed nine 50-mile AERC rides with owner Thomas Booth. Fabah Serr (2001 gelding, Ibn Sabbah Bedu+/ x Fabah Mahrena) competed in Trail and Working Cow, winning Champion Trail Horse in Region 7 and Top 4 in Region 8. He is owned and ridden by Teri Johnson-Kelley. Galaxy Annuket WZ (2001 stallion, Galaxy I x TreffHaven Nageed) continued to develop his record in endurance, taking second or third in all four rides. He is ridden by Rebecca Hayden for owner Marie Sobiski. Mah Sabbah Bedu (2001 stallion, Ibn Sabbah Bedu+/ x Bint Roulett) added to his multiple-year wins in First-level Dressage and Sport Horse. He was Region 9 Champion Arabian Sport Horse Stallion In-Hand AT and Top 3 in Sport Horse Under Saddle and Sport Horse Stallions In-Hand. He is trained and ridden by owner Dr. Keith Kosel. Dr. Kosel also trains and shows Nefrett, who was top ten in the community shows division (details below). Susar El Khamor (1996 stallion, Masada El Rabdan x Om Khamsa) continued his winning ways in Region 9 Second Level Dressage, Show Hack, Hunter Hack, and Sport Horse, trained and ridden by owner Susan Mayo. He was top 5 Dressage Second Level at the Region 9 Sporthorse Championships. Susar Masladan, (1998 stallion, Masada El Rabdan x AK Maslaha) is ridden in endurance and competitive trail by owner Mary Fields. Thee Macade (2000 stallion, Thee Desperado x *Masira) continued in endurance and limited distance, with Championship in the Region 12 55-mile ride. He is owned by Matthew and Wendy Thompson, ridden by Susan Thompson. These top ten horses represent all historic bloodline groups of Desert Arabian heritage. OT Dytu RSI is Pritzlaff breeding of Egyptian/Blunt lines. Khehanad Adhem+/ is Egyptian-sired, with Egyptian, Davenport and other early imports in his dam-line. Seven are Straight Egyptian (Fabah Serr, Galaxy Annuket WZ, Mah Sabbah Bedu, Shy Gayfeen++++//, Susar El Khamor, Susar Masladan, and Thee Macade). AAS Al Sakb+/ is from the Blue Star tradition of predominantly Saudi breeding. The Institute also recognized top ten among horses that competed in local, community, 4-H, and other shows in less-traditional events. Top point horse was Malika of the Nile 1998 mare, shown at open shows in all disciplines by youth riders. She is owned by Julia and Frank Maruyama. Demonstrating her versatility, Malika won both the Open and 12-and-Under classes at the Great American Trail Horse Competition in Scottsdale, AZ in December. Other top ten are Nefrett (2000 mare), Masada Susar (2002 mare), Fad Maahrus (1990 gelding), TreffHavenAlizeer (1997 gelding), Treff-Haven IbnNaheed (2002 gelding), and RA Bint Numana (2001 mare); all competed in multiple disciplines such as Dressage, English Pleasure, Western Pleasure, Trail, Equitation, Show Hack, Hunter Pleasure, and Costume. Mystic UF (1987 stallion), Rababe CF (1987 mare), and Elbereth TOS (2000 mare) competed in the growing sport of Mounted Shooting. For further information about the Drinkers of the Wind award program, contact Susan Mayo, competition secretary and member of the Institute Board of Directors. Participation is free.